The LENGTH measurement is the maximum distance over the widest part of the radiator. In most cases the radiator valves are the widest part so the measurement would be taken as the overall distance from VALVE TO VALVE. The HEIGHT measurement is taken from the floor to the top of your radiator. The DEPTH measurement is from the wall to the front face of your radiator - or the widest point forwards if the valves come further out than the radiator. If you require skirting cut-outs in the sides of your cabinet please enter the maximum Height of your skirting here. The cut-out made is designed for skirting boards only (i.e. with a curved corner) and therefore the height you enter will be the max height of the cut out with a 9mm radius into the corner. The cutter cannot cut square cut edges into the skirting cut out. Therefore if your skirting board is square cut or you require the skirting cut out to cover e.g. square cut boxing in then you will need to add either 9mm onto the height dimension or 5mm onto height and 4mm onto depth dimension (or vice versa) to allow for this and please note that the resultant cut out will not sit tight onto any right angle corner due to the radius in the corner of the cut out. If you require skirting cut-outs in the sides of your cabinet please enter the maximum Depth of your skirting here. Enter in this box the measurement from the floor to the centre of the Thermostatic valve. We will cut a 150mm high x 90mm wide access hole in the side panel and supply a cover flap for the hole. The side for the cut-out is taken as viewed standing in front of the radiator facing it. The minimum depth of radiator for this service is 100mm, if you enter a depth of less than 100mm, we will increase the depth to 100mm. Enter in this box the measurement from the wall to the centre of the thermostatic valve. Length; measure the overall distance from outside valve to valve (this is probably wider than your actual radiator itself). Classic design Removable Front Covers only: Please note that if you wish to purchase a Classic removable front cover in order to provide valve access then, provided you have the external space available, you will need to add a further 75mm to the length of your radiator when ordering for each side of the radiator you wish to gain access to (i.e. 150mm if you wish to gain access to both sides). This will then ensure that you can reach the sides of the radiators through the internal sub-frame. Height; this is from floor to the top of your actual radiator. Depth; is measured from the wall to the front surface of your actual radiator - or the most forward measurement if your valves or other obstruction come out further than the radiator. Please note that you must ensure that the radiator depth entered when ordering is a minimum of 100mm if you wish to request a valve cut out otherwise the order will be cut automatically for a radiator depth of 100mm. The overall assembled external length of the made to measure cabinet will be 56mm longer than the measurement you enter when ordering. This allows 10mm each end for air flow and 18mm each end for the thickness of the side panels. The top shelf will overhang the radiator cover by an additional 20mm at each end. The overall assembled external height of the made to measure radiator cover will be 68mm taller than the measurement you enter. 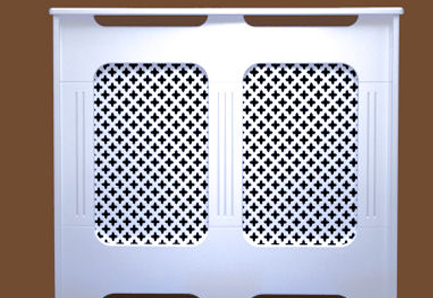 This allows 50mm for airflow above the radiator and 18mm for the thickness of the top shelf. The overall assembled external depth of your made to measure radiator cover will be 52mm deeper than the measurement you enter (to the front of the side panels). This is made up of 10mm for airflow, 18mm for MDF thickness, 4mm for grille thickness and 20mm for the construction of the cabinet (as the front panel is recessed into the side panels). The top shelf will be a total of 62mm deeper than the measurement entered in this box (as there is a 10mm front shelf overhang). In the case of our classic design removable front covers, the necessary sub-frame adds a further 20mm to the overall depth of the cover. If the above additons mean that the cabinet will not fit in the space you have available then please read our FAQ section for details on how to get around this or ensure that you email us before ordering. 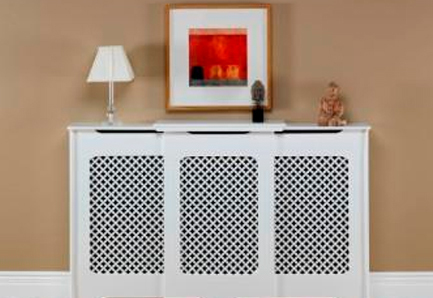 We are a small family owned company selling a range of ready made radiator cabinets. We sell these direct to consumers only through the internet as this method allows us to sell our higher quality products at prices that compete favourably with lower quality/priced cabinets and also means that our customers routinely contact us via the internet/email, thereby negating the need for manned telephones. We do not have a shop, showroom or an office that is staffed during normal working hours as such overhead costs would mean we would be unable to offer our products to our customers at such competitive prices.